Let’s start by saying we want people to give and receive credit where it is due and to abide by all copyright laws. Now that we are clear on that, let’s lay out the problem and our solution. One of our programs wants to use Google Classroom (yay! ), but their firewall blocks anything YouTube related. After hours of testing possible solutions and talking to the Google Apps for Education Support folks, we realized that Classroom has one big glitch: no embedded (YouTube) videos. Until Google finds a way to strip away everything on a video posted in Classroom, we have to use an imperfect work around. Teachers will need to download the video they want students to view and upload it to Classroom. This workaround presented an additional challenge: which downloader should teachers use? Our research revealed confirmed that the majority of the download services out there present significant limitations for people in secure environments. These can range from ads on the screen and confusing interface to attaching unnecessary things in exchange for using the service. The worst of these include a virus, malware, auto setup of a search bar that displays ads everywhere and redirects web searches through their search engine. All of this leads to our tech staff having to handle cleanup, sometimes even being forced to reimage the machine. Also, the files that result from these downloaders are often flagged by our virus scanners. 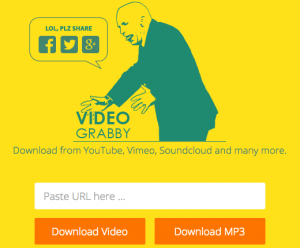 Enter VideoGrabby a free YouTube (and other tools!) downloader that has a super clean interface, fast functionality, and no weird aftereffects. On VideoGrabby, teachers see two buttons: “Download Video” and “Download MP3”. Easy peasy! No confusing settings or random ads and buttons. Just paste, click, done. Enormous thanks to Muataz AlMufti and Joe McLaughlin for their diligent research and testing!